This was from a few weeks ago when we had our first snow of the year. It only snowed for a few hours and then disappeared completely before midday, which was disappointing. It wasn't very cold out so I thought it would be a good time to wear this new dress I found at the thrift store. 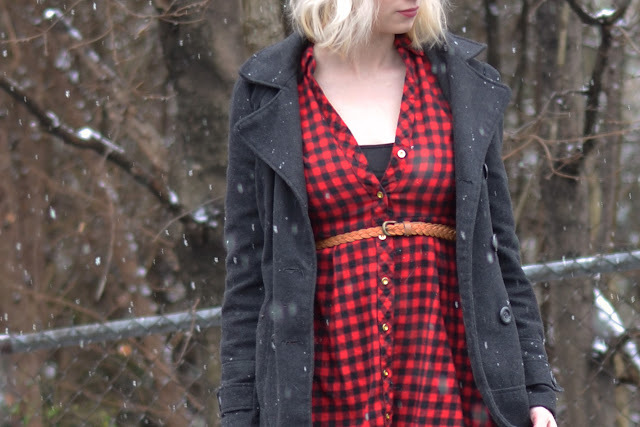 I had been hoping to find a plaid dress for a while so I was very excited when I stumbled upon this one. Maybe one day I'll find another one that isn't so short and I can wear it without leggings. That's one reason I love thrift shopping, you never know when you're going to find something you've been looking for!